I am so proud to share with you that a family from India have just been awarded their TAP certificates by USATAA. 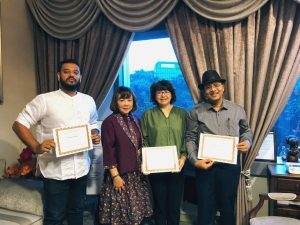 Dr. Rajan Bhonsle, M.D; Dr Minnu Bhonsle, Ph.D; and Aman Bhonsle, MBA of Mumbai, India are likely the first family unit in Asia to comprise members who are all certified TAPs. It is a significant achievement not only for the Bhonsle family, but a significant development for the TA community in Asia. They shared that they are excited to apply their newly-acquired TA competencies by providing counselling services and workshops at the Heart to Heart Counselling Centre in Mumbai.